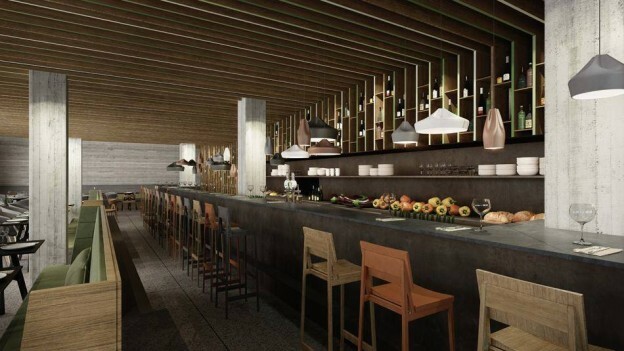 Bindella Osteria & Bar opens its doors in the heart of Tel Aviv’s White City; reinventing the traditional Italian restaurant into a more high end design-led venue for city dwellers. The relaxed contemporary design concept was inspired by the Bindella family vineyard in Tuscany. Local architects Pitsou Kedem Architects and Baranowitz-Amit Design Studio created a ceiling treatment that mimics the vineyard’s pergola and imitates the organised and spacious arrangement in between the vines. 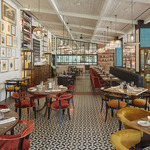 The grape motif is seen in the metal screens and a feature front door, while a long communal crudo bar adds to the overall informal, yet precise atmosphere. The menu, created by Israeli chef Roy Soffer, introduces innovative and light interpretations of classical Italian dishes using simple raw ingredients, such as the tuna tartar topped with limoncello caviar, and a starter of octopus carpaccio with fennel, mint, and fresh chili. In the evening, Bindella Osteria & Bar goes from laid back lunch spot to vibrant late-night eatery, offering an inventive cocktail menu and a wide selection of wine and grappa imported from the renowned Bindella family vineyard in Montepulciano, Tuscany.